Otter Pops fans in Southern California have reason to rejoice again this Summer as the second annual Otter Pops Tour kicks off, giving fans unprecedented access to the West Coast’s most beloved frozen treat. A completely unique take on the tiny house phenomenon that has swept the nation, the Otter Pops Beach Bungalow is an 18’ X 26’ one-­of­‐a­‐kind consumer experience that invites guests to immerse themselves in all things Otter. The Beach Bungalow features an Otter Pops tasting bar where a “pop tender” offers consumers the choice of one of six zippy ice pop flavors and iconic characters including Sir Isaac Lime, Alexander the Grape, Poncho Punch, Strawberry Short Kook, Louie-­Bloo Raspberry, and Little Orphan Orange. 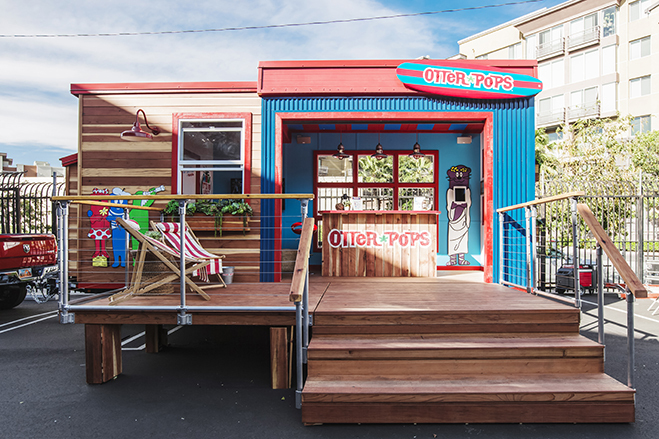 Fully equipped with a deck for lounging, beach chairs, flat screen TV’s with custom content and entertainment, music, games and fun activities, the Otter Pops Beach Bungalow is the ultimate Summer hangout. Period. During the inaugural “Otter Pop Vibes Tour” that took place in the Summer of 2017, the Beach Bungalow made its way to various locations in and around Southern California, as well as other iconic festivals and retailers. Hundreds of thousands of pops were handed out with countless more memories made throughout the stops. The Otter Pops Tour returns to Southern California bigger and better than ever this Summer, making this year’s season all the “cooler” by inviting Otter Pops fans to open up a freezer full of possibilities with us. Embarking on the ultimate Summer road trip, the Beach Bungalow will tour through LA and OC hotspots May through August, posting up at some of the most highly anticipated summer events including Wango Tango, the Dew Tour, the Orange County Fair, the Pasadena Chalk Festival, the California Strawberry Festival and more. It’s only here for the Summer and it won’t last long, so check out the Otter Pops Tour schedule by clicking the “Join the Party!” button above and make sure to take some time out with family and friends to chill out with us and create moments that will never melt away.